Patrick Bet-David, Host of Valuetainment gave me a nice compliment on my energy via Instagram Direct Message, I have chatted back and forth with Pat and love his amazing show on business and life, Valuetainment. If you have never heard of PBD or Valuetainment, Google him or check him out here. 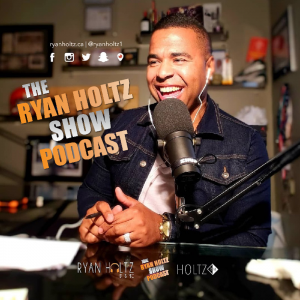 In this episode of The Ryan Holtz Show, I talk about fatherhood and how it is impacted me from my lens and perspective. I also dedicate this episode to my Son, Daijon Holtz who is the real MVP here. Aaaaaah I straight up looked in a dictionary to figure out some words to properly articulate how I feel and the impact of stepping into the father club. Please enjoy and drop me a message as to what you think. Also…..none of this would be possible without my partner and wife, Mrs Holtz! Love you boo! Ep 59: 72 Hours From Playing Pro Basketball….And Then POP! Cornell Thomas Drops By To Chop It Up! 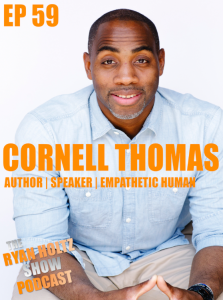 In this episode of The Ryan Holtz Show Podcast, I chop it up with my man Cornell Thomas. Cornell is a human like not other with a story that is compelling and true form to raw life. In this episode, we chat about how Cornell went from almost playing pro basketball…actually just 72 hours away and then POP! Cornell had an injury that changed his whole trajectory and used this to learn empathy, fierceness and become a student of life. I am the youngest son of Bobby and Tina Thomas. That sentence is very important in regards to who I am. If not for my parents I wouldn’t be the man you see today. My father passed away when I was just three years old, and although my time with him was brief I have learned through others the amazing legacy that he left behind, as a police officer and community leader. My fathers passing forced my mom to become our everything. She was now our main provider, mother, and life educator. She was forced to become an expert problem solver, and that skill was passed down to her children. My mom raised us on the adage, everything happens for a reason”, and that one lesson out of the myriads of others she has taught me was never forgotten. It’s what I remembered when I suffered a career ending basketball injury, (right before going to play professional basketball) and the first thing I think about when any adversity comes my way. I am a global speaker, multiple title author, mindset coach, team builder, and corporate trainer. But more importantly than any of those titles I’m a husband and father to my son Bryce (5) and my daughter Niya (3). Ep 58: Being Innovative & Disruptive Requires Being Hated & Loved! The Esteemed Shawn Kanungo Drops By To Chop It Up! 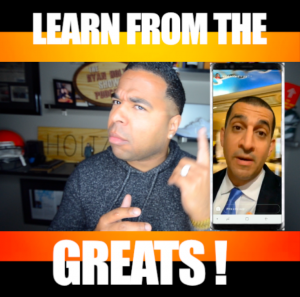 In this episode of The Ryan Holtz Show, I chat with Shawn Kanungo, the famous Keynote Speaker and Disruption strategist! Shawn has been on my radar forever and it is such an honor and pleasure to sit down with him. Shawn has carved out his own path in the corporate world and speaking world by being curious, asking the tough questions and helping big businesses become quick and lean when finding new ways to be valuable to their clients and customers. This episode is truly a banger and we shot it LIVE at The Enbrdige Tower in Downtown Edmonton. Thank you! Enjoy this episode and drop your thoughts in the comments and on social media! 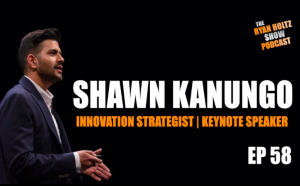 Shawn Kanungo is a disruption strategist. He has been recognized nationally and globally for his work in the innovation space after 12 years working at Deloitte. Shawn’s mandate at the firm was to help corporate executives to better understand and plan for the opportunities and threats associated with disruptive innovation. Shawn is a practitioner who has worked hand-to-hand with hundreds of organizations on their journey to digital transformation. He has adopted the concepts of voice technology, behavioural economics, user-centered design, crowdsourcing, artificial intelligence, drones and film to help create world class client experiences. Shawn is a Partner with Queen & Rook, helping organizations adopt exponential technologies and move to the digital age. He is also the Founder & CEO of Silver, a technology company focused on creating the next-generation of voice products and services for businesses. His work and interviews have been featured in Forbes, The Globe & Mail, The Guardian, CBC and CTV. In 2016, he was recognized as Avenue Magazine’s Top 40 Under 40. In 2018, he was named to Inc’s 100 Most Innovative Leadership Speakers. In this episode of The Ryan Holtz Show, the lovely and fierce Kristen Crowley joins us to chat life, being a News Anchor and what it takes to overcome adversity. Kristen is a special human who has the personality, the brains and takes pride in her appearance, but does not let that define who she is. Growing up on a farm to being bullied, all the way to having two high risk pregnancies, Kristen defies the odds in all ways. I personally crossed paths with Kristen via LinkedIn and we began to have really intellectual and thought provoking conversations. What really stood out was how engaged she was and detailed when talking. This podcast is a heavy hitter and touches on all aspects of life, enjoy the nuggets! FITNESS – I can talk about how fitness became more of a passion after two high risk pregnancies and I got a 6 pack for the first time in my life (nutrition, weight training, debunking myths) and why I am doing the food stuff now. MOM LIFE – Managing time, getting kids to eat healthy, food education. OVERCOMING – why I pushed myself out of my comfort zone and took a TV job. Also why I give back so much and try to make other people feel included. Kristen Crowley is a TV personality, news anchor, military wife, mother of two that has a unstoppable curiosity for health and fitness. Growing up on a horse farm, hard work was the norm. Kristen set out to learn and conquer several career paths from Fashion Merchandising to the restaurant business taking her from her home state of Michigan to Virginia. That drive led her to a career in TV news and over a decade later she is using that notoriety to make a difference for others. After two high risk pregnancies and a slew of injuries and food sensitivities KC set out to learn the easiest ways to live a healthier life in a simple but effective way. She launched Kristen Crowley Live on YouTube and a new blog www.kristencrowley.com to help share free recipes, workouts and to help connect people to the experts that make a difference. No hype, No BS, just solid information you can use. Join Kristen on her journey as she continues to learn, stay sane working crazy hours and manage her own self-proclaimed zoo at home! Reach out to Kristen here. 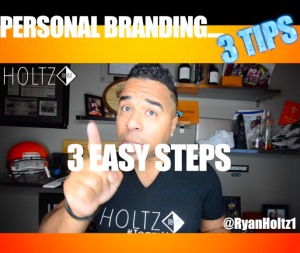 In this episode I chat quickly about personal branding and what it means. Personal branding has been something that has been spoken about so heavily over the last few months. I think it has somewhat became a buzz word, but it is IMPORTANT and can help you get everything that you want in life. 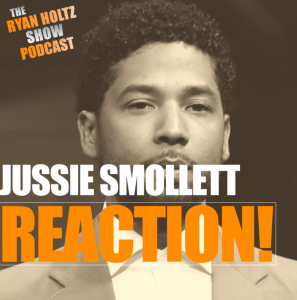 I give my thoughts about empire cast member, Jussie Smollett and his alleged fabrication of his own hate crime. If this is true, he gets my “knucklehead” of the day award. Drop your thoughts on this situation. Ep 54: Getting Shot At Point Blank Range. Rob Howze Joins Us To Chat About How This Impacted His Life! 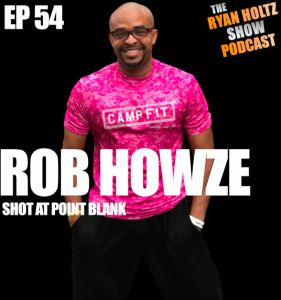 In this episode of The Ryan Holtz Show Podcast I chat with Rob Howze about how getting shot at point blank changed his whole trajectory on life and how he changed his life to the better. Rob is someone exudes a different and boisterous kind of energy that really shows. Rob has came up with a formula that he lives by to ultimately have him live his best life on the daily. There is much value for you to be had on this podcast and truthfully, no matter where you are at in your life…..relax….press play and be ready to laugh, cry and pick out some nuggets that Rob has generously provided. As always, thank you for supporting and listening to the show. We have heard many responses from you of pure value. We could not do this without you! Enjoy! 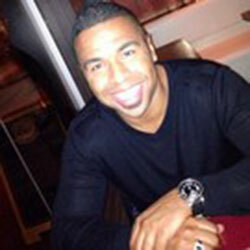 Rob Hows is a personal trainer, licensed minister, public speaker and author with 20 plus years of business development. Rob is someone who has literally made a great life with a very specific view point. Ep 53: Brands taking a leadership role in helping humanity love each other again and taking social responsibility. Guest, Nichole Kelly chops it up with us! 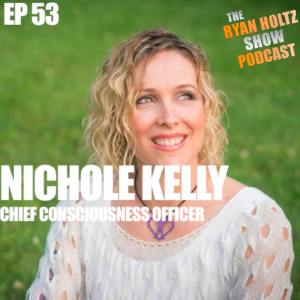 In this episode of The Ryan Holtz Show, Nichole Kelly drops by to chop it up about how mission-driven companies are starting to calculate ROI (Return On Investment). In the new age of marketing and adoption of people-first companies, the way we calculate ROI is changing and many companies are still trying to figure out and maneuver around this. I had met Nichole about 6 years ago and she came and spoke at a conference, and went way deep given that the United States was way ahead when it came to digital marketing. Nichole is a fantastic speaker and extremely knowledgeable and I think you can get great value from listening to her. She is amazing! Sit back, grab a nice little drink and get ready to have your mind massaged. Enjoy! 1. ROI? What is it? How do we value it? 2. Content, when should we keep it? when should we let it go? Nichole Kelly is the Chief Consciousness Officer at the Conscious Marketing Institute and co-host of the Conscious Marketing Podcast. She is best known for her book How to Measure Social Media and setting industry standards for how return on investment (ROI) from digital marketing is measured and valued within organizations. After experiencing 3 minor strokes from the hamster-wheel of success and chasing profit, she is back to set the record straight: ROI is NOT the bottom line. Now she consults with companies to unlock their marketing team’s full potential and empower them to achieve ROI Cubed; a positive alignment of Return on Investment; Intention and Impact. 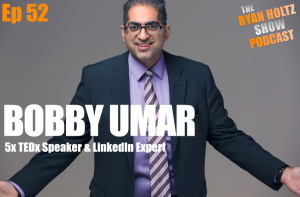 In this episode, I chat with Bobby Umar, 5x TEDx speaker and LinkedIn expert. Bobby is someone who hosts a wealth of events and has a wealth of knowledge to help YOU get the most out of your professional career. We also chat about fatherhood too! Social impact communities that have formed given the vehicle of social media has been amazing, but also can be quite divisive if not controlled. We chat about this. 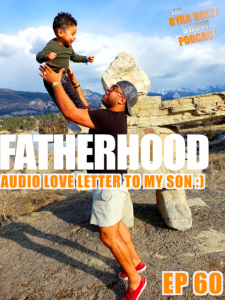 This episode is jam packed with topics such as social media, fatherhood all the way to really cultivating your online presence both personally and professionally. 2. People who say they do not care about likes, retweets and comments also known as vanity metrics….THEY DO!